I'd planned on a final long run of 30K this past week but after a bit of reading on the do's and don'ts of tapering decided against it. Instead, I ran a couple of 20K distances and a 10K. No question, I felt a little guilty ... lazy even. Later on in the week all that changed with a run that changed everything. I stumbled across this picture about 6 months ago and kept it. I did so to remind myself of what I thought great running form looked like. Of the two runners, Kazuya looks so much more relaxed, balanced and efficient. There is no doubt he is running taller. It's almost exaggerated but in no way does it look overdone. Every run should have a distinctive goal or purpose or so they say. More often than not though I count 'got it done' as mission accomplished. Saturday's 20K run was an opportunity to gain some much needed confidence and perhaps to even fine tune my running form. Stumbling upon Kazuya's picture earlier in the day gave me just the assignment I was after. 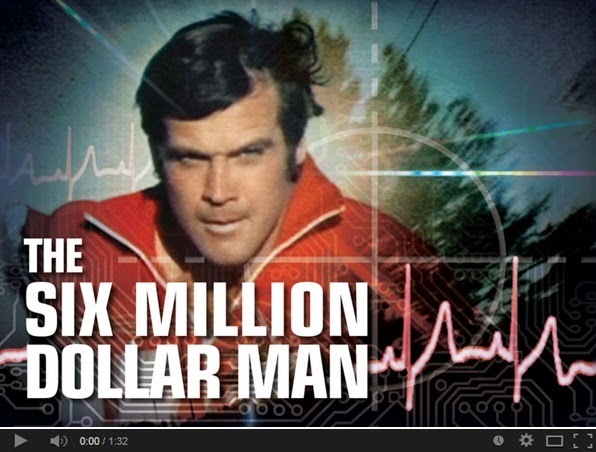 Six Million Dollar Man poster on their wall as a kid? Click this VIDEO image for a trip down memory lane. Oscar Goldman would surely have been satisfied with my effort. control and relaxed the whole way. Not much else to report on this week. Rotorua Marathon is now just 11 days away. With this one being the 50th, entries are pouring in. Am I nervous? A little. Ive run it twice before and never had a good day. You might recall my last was the catalyst to start this awesomely dull blog. Your advice since has been a big help and I do really appreciate it. Better, Stronger, Faster yet still running raggedy now signing out. Have a great week everyone. Really nice training run there Mark. Steady 4:36ish all the way. Steve Austin would be proud! Enjoy what remains of the taper. I'm expecting a good race (no pressure though!). Thanks Ewen. Ive felt really good of late. That step up from 40K per week to 70/80K per week has made a big difference. Get through Saturday and I'll ramp things up to 100K. Unlike you, back in the day, that 4.36 felt bloody fast! Ha! Funny that. It's my 5k race pace now, and feels bloody fast!